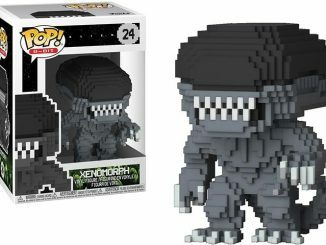 Remember those cool 8-Bit Pop! 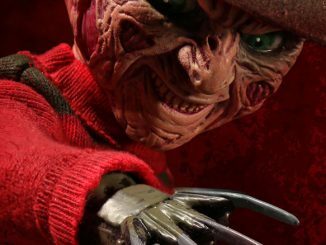 vinyl figures of Freddy Krueger and Jason Voorhees from last year? 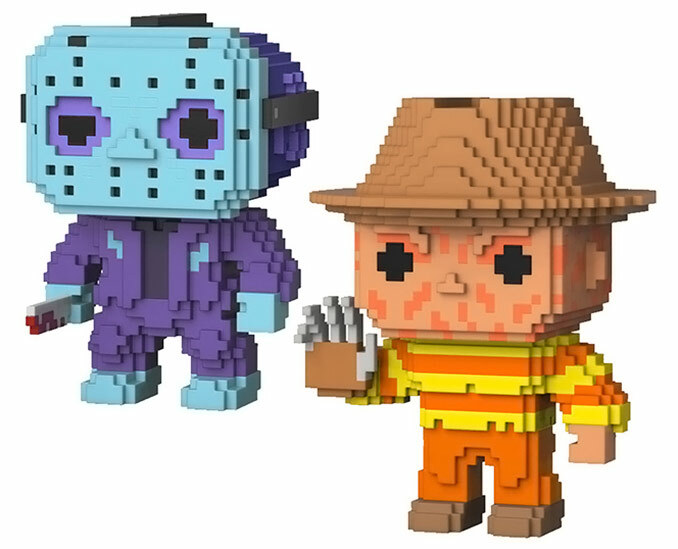 They just came out with new versions of these NES 8-Bit Horror Funko POP! Vinyl Figures, and this time they’re colored to match their look from the classic Nintendo Entertainment System games from 1989. 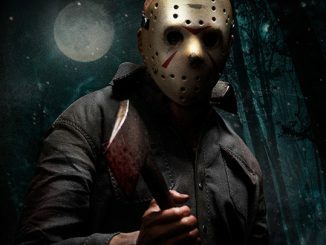 Straight from Camp Crystal Lake and Springwood as recreated on the NES come Jason Voorhees from Friday the 13th and Freddy Krueger from A Nightmare on Elm Street, a GameStop and ThinkGeek exclusive. In their unique color palettes, they’ll remind you of summer breaks long ago spent vainly trying to avoid dying and taking out the trash. 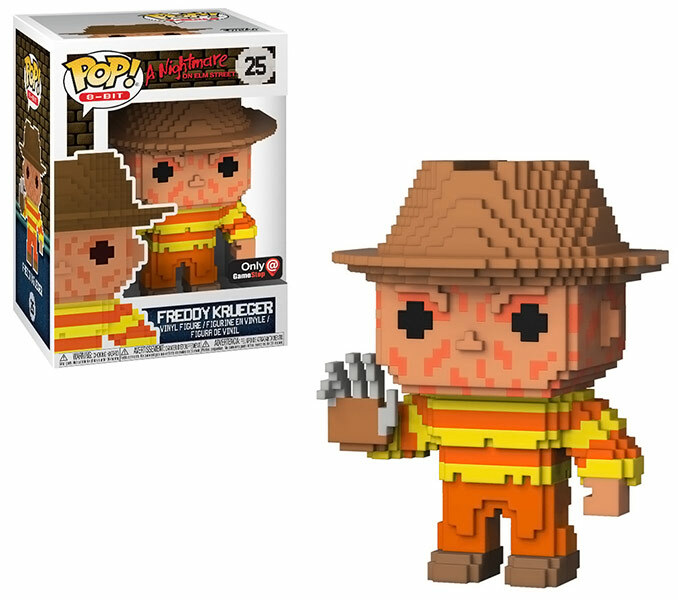 Bonus: Freddy’s bodyparts are not detachable from the POP! so your other POP!s don’t have to worry about fighting them in boss battles, because that’s just wrong. 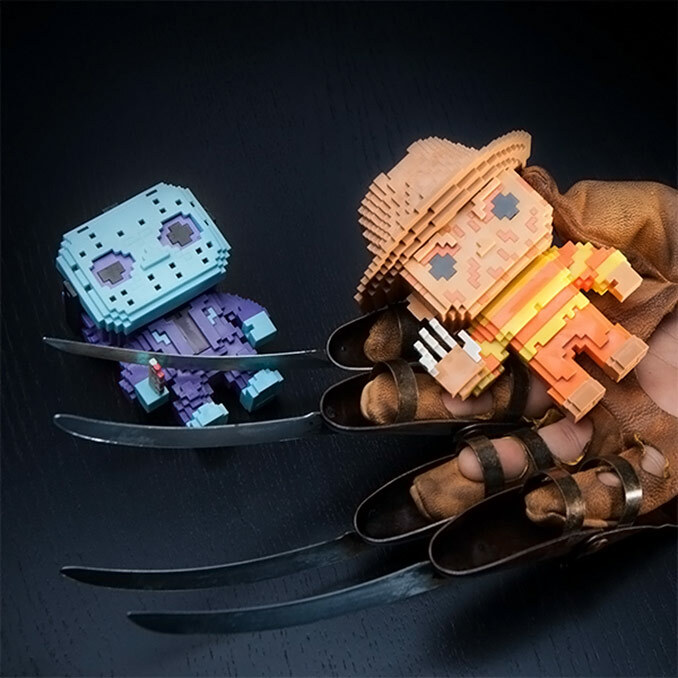 This cute 8-Bit POP! 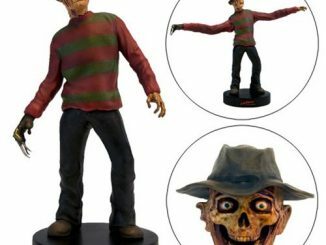 Freddy Krueger vinyl figure is based on the A Nightmare on Elm Street video game for the Nintendo Entertainment System. 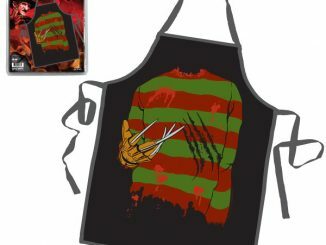 It was released in October 1989 and loosely based on the Nightmare on Elm Street franchise. In the game you play an ordinary teenager, where you have to locate and collect the bones of Freddy Krueger and incinerate them in the high school’s furnace. 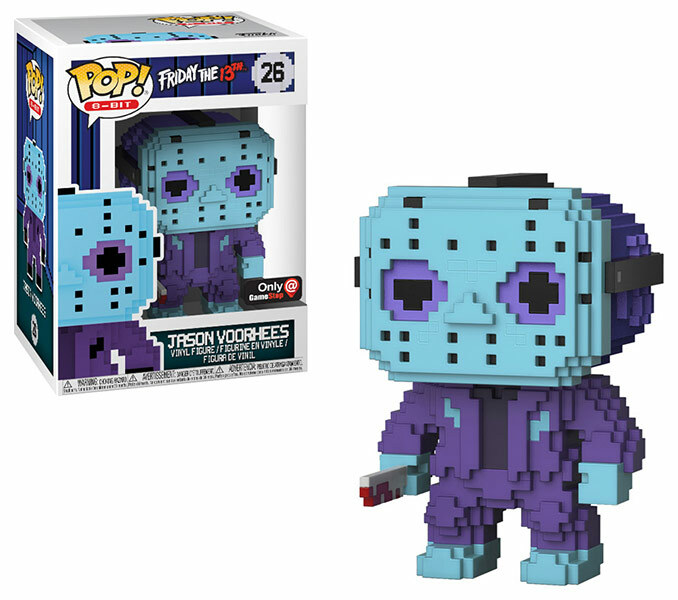 Likewise, the 8-Bit POP! 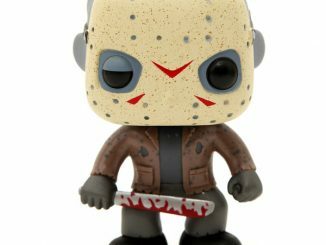 Jason Voorhees vinyl figure is based on the Friday the 13th NES video game. 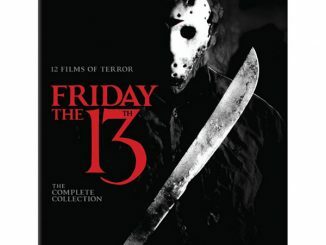 It was released in February 1989 and based on the Friday the 13th franchise. It was a side scrolling, survival horror video game where the player controls on of 6 camp counselors. 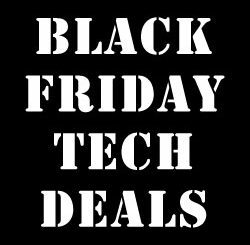 You’re attacked by zombies, wolves, and crows and you advance toward your goal of finding and defeating Jason three times. 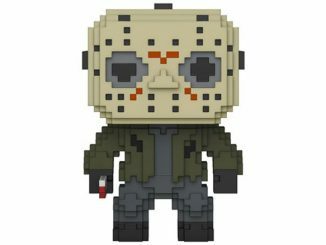 NES 8-Bit Horror Funko POP! 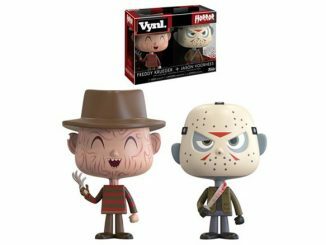 Vinyl Figures are available at $11.99 each at ThinkGeek. 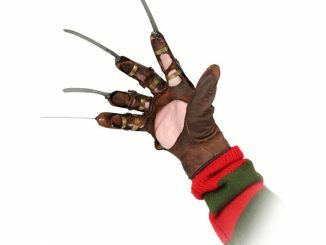 You can also find both the Freddy Krueger and Jason Voorhees at GameStop, but they’re not available elsewhere as they are a ThinkGeek/GameStop exclusive.